It’s Friday, Christmas is less than two weeks away, and we’re so happy to host author Colette Auclair, whose debut novel, THROWN, goes on sale Monday! 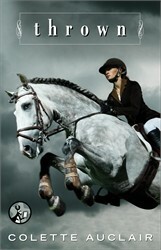 Set in the high-stakes world of professional show jumping, THROWN features a down-on-her-luck horse trainer who takes a summer job in Aspen teaching the spoiled daughters of a big-shot movie star. She braces herself for three miserable months. But by Labor Day, she has to choose between capturing a gold medal…and the man who has captured her heart. Read on to find out what Colette’s unforgettable characters hope to find under their Christmas trees this year. It’s been said that novelists think of their books as children. If this is the case, I’m about to give birth to my first—my debut novel, Thrown comes out on Monday. Although I’ve never given birth to an actual human, I hear it takes nine months of glowing, morning sickness, eating for two, craving odd foods, weeping, aching, getting new clothes, acquiring new furniture and gifts, and having someone else tell you what your feet look like because you can’t see them. Many of these apply to writing a novel. There’s glowing, sleeping, weeping, eating for two—especially with that difficult-to-write scene, where another round of Oreos might be just the ticket—getting new clothes (or maybe that’s just me), and aching over whether it’s good enough. Happily, I could see my feet whenever I wanted. Then the blessed event occurs. For unto us a book is born. A child. And at this time of year, what do millions of children around the world do? They write to Santa. My characters have followed suit. If you could swing it, I’d love to ride in the Olympics. You have a few years to arrange for this. In the meantime, a new pickup truck would be great since mine barely made it from Ocala to Aspen, but if that’s too much (and I understand if it is), could you somehow get my horse back? And make these kids I’m teaching to ride behave better? My boss could be a little (a lot) nicer, too. I’ve got everything I could ever want, materially speaking. I live in a huge house in beautiful Aspen with my daughters, I have more money than I need, and I get to make a living making movies. The thing is, I’ve got a major crush on my new riding instructor. You know me, I’m naturally charming, but with her, I seem to constantly make her either nervous or angry. A little help here, big guy! I usually kill at improv, but she ties my tongue in knots. P.S. If you ever want to get into movies in your off-season, give me a shout. Love your laugh! I want a prettier horse. I also need a stylist, which my dad doesn’t seem to understand about. Also a new sister, since mine is stupid and annoying. You could give her to someone who wants to adopt an eight-year-old. Preferably far from Colorado. I would like a real pony. I have a horse, but I want a pony. And for my dad to stop making me eat vegetables. Say hi to the reindeer for me. There you have it. My characters’ wish lists. Do you have a favorite character you’d like to spend the holidays with? A character you’d ask Santa to leave under the tree? Thanks for stopping by, and I hope all your wishes come true! Now that I’ve read this fantastic book, I’d like the next book in the series to magically appear in my inbox, Santa! Too funny, Colette! Can’t wait for my copy to arrive. Merry Christmas to you and your characters. I’d take them under my tree, but the anticipation would be too much. So, I’ll muse on world peace and read your debut novel.